Learn PD and understand that it has synergism with sulfonamides. Trimethoprim is a bacteriostatic drug, but it is used synergistically with sulfonamides because they inhibit sequential steps in DNA synthesis. 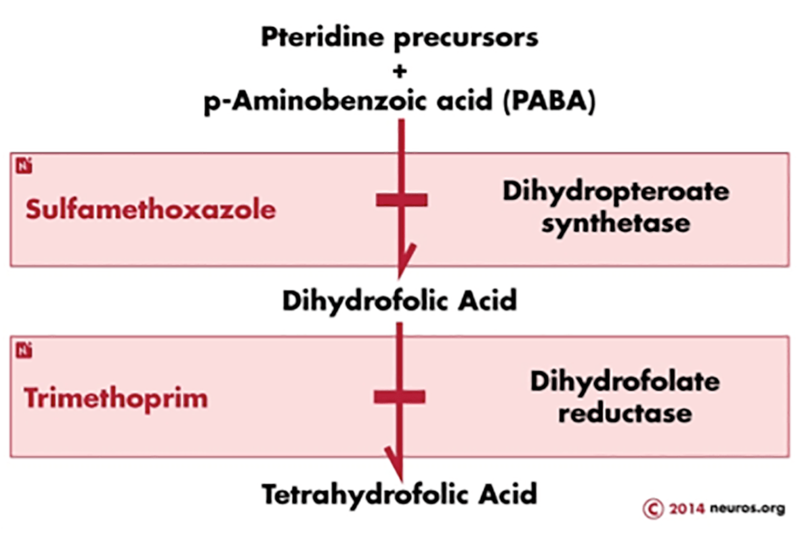 This combination then becomes bactericidal. Bactrim has a broad spectrum of uses: PCP pneumonia, bacterial diarrhea (treat salmonella and shigella) and UTI/prostatitis. IV Bactrim is used to treat severe PCP pneumonia. Well absorbed and distributes to all body tissue, including the CNS. Dose needs to be reduced in renal impairment. It is a weak base, and therefore tends to concentrate in urine (which is a weak acid). This property increases its activity in prostatic and vaginal fluids. Also has other idiosyncratic reactions – N/V, vasculitis and renal damage.